Jan. 16, 1949, in Los Angeles; grew up in Tucson, Ariz.
Held a variety of posts ranging from ship master to com- mander of various USCG regional and coastal groups, to posts in the offi ce of acquisitions, offi ce of programs, and offi ce of chief of staff, eventually becoming chief of staff to the commandant. Horizon oil spill in the Gulf of Mexico in 2010 while still commandant of the USCG. He continued in that role after his retirement from the Coast Guard. Worked closely with the Department of Homeland Security, advancing much-needed operations and management co- ordination principles. 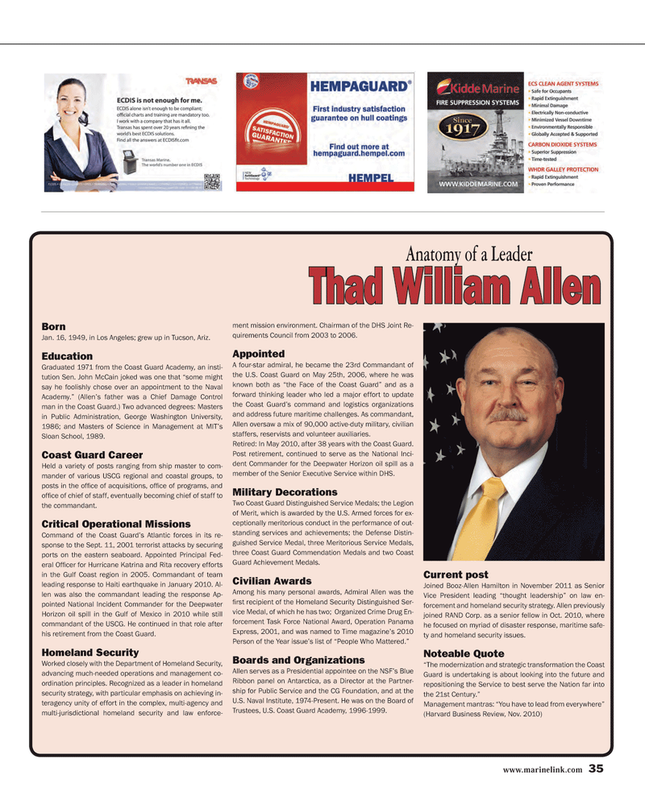 Recognized as a leader in homeland security strategy, with particular emphasis on achieving in- teragency unity of effort in the complex, multi-agency and multi-jurisdictional homeland security and law enforce- ment mission environment. Chairman of the DHS Joint Re- quirements Council from 2003 to 2006. Allen oversaw a mix of 90,000 active-duty military, civilian staffers, reservists and volunteer auxiliaries. Retired: In May 2010, after 38 years with the Coast Guard. Post retirement, continued to serve as the National Inci- dent Commander for the Deepwater Horizon oil spill as a member of the Senior Executive Service within DHS. Trustees, U.S. Coast Guard Academy, 1996-1999. Vice President leading “thought leadership” on law en- forcement and homeland security strategy. Allen previously joined RAND Corp. as a senior fellow in Oct. 2010, where he focused on myriad of disaster response, maritime safe- ty and homeland security issues.